HIPPODROME RECORDS was formed by PETER STRINGFELLOW and DAVID MARTIN. 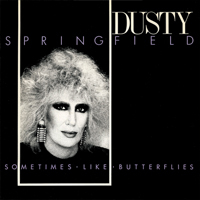 They released a number of memorable singles in the mid ’80s and one of their star signings was DUSTY SPRINGFIELD, who sadly only recorded one single released in 1985 for the label which is now re-released for the very first time. “Sometimes Like Butterflies” is regarded by many Dusty fans as a long-lost classic from her memorable catalogue.